One of the photographers I met while covering the Breeders’ Cup “Win and You’re In” race in Chile asked if I had ever heard of the Spanish horse racing website, ElPotroRoberto.com. I hadn’t, so he suggested I look it up as a way of improving my Spanish. I began following the stories and updates on races in the United States, and found it very helpful for expanding my equine Spanish vocabulary. During the summer of 2016, I worked as a staff writer for The Saratoga Special, a publication that covers the races at Saratoga Race Course. One morning, on my way to interview a trainer, I recognized Roberto Rodriguez, the founder and owner of ElPotroRoberto.com. Spanish horse racing media is growing. And it makes sense, considering the afore-mentioned percentages of Hispanics working in the United States horse racing industry, that there would be specific media presented in their native language. The commencement of the 2015 University of Arizona Racetrack Industry Program Global Symposium on Racing began with a panel presentation of ideas to improve and market the sport of horse racing. One of the first of 45 suggestions was offered by Steve Byk, host of At the Races radio program, who highlighted the New York Racing Association’s race calls in Spanish, but pointed out that despite the high level of Hispanic involvement, the racing industry does little to develop them as fans (Angst, 2015). The New York Racing Association (NYRA) race calls (meaning narrations of races as they take place) mentioned by Byk, are performed by Luis Grandison, a native of Panama who began working with NYRA in April, 2014, according to a 2016 Thoroughbred Racing Commentary article by Bob Ehalt. Grandison worked as a race caller at El Hipodromo Presidente Remon in Panama City for 25 years, before moving to the U.S. in 2009, and meeting Dan Silver and Mitch Levites, who work for NYRA, in 2011. Ehalt writes about Silver’s (NYRA’s Senior Director of Television) views on the importance of Grandison’s position from a wagering perspective by stating that “NYRA can now offer their races to tracks and simulcast outlets in areas such the Caribbean, Central America and South America in a form that patrons can readily understand and which encourages them to wager. Grandison also has a Twitter account (@GrandisonLuis) that he uses to interact in Spanish with NYRA fans, improving relations with a segment of customers who could feel disenfranchised because of the language barrier” (Ehalt, 2016). 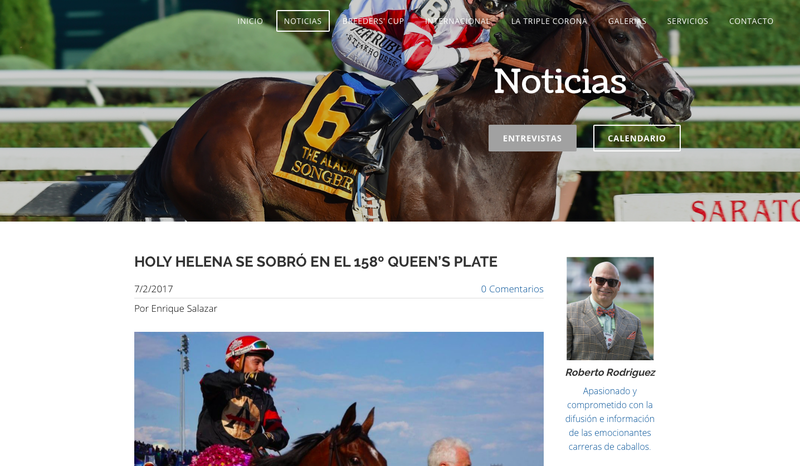 The article also quotes Stephen Panus, Vice President of The Jockey Club’s America’s Best Racing, a Thoroughbred fan outreach organization that offers some content in Spanish. “With 55 million Hispanics now calling the United States home, it’s vital that horse racing markets itself to this growing audience. The addition of Luis by NYRA as a Spanish-speaking announcer was a positive and welcomed step in this direction,” said Panus (Ehalt, 2016). One of the places where Latin American horse racing fans and Spanish speakers can hear the voice of Luis Grandison, is on the Horse Racing Radio Network’s HRRN en Español. On July 20, 2016, The BloodHorse website published a press release announcing that HRRN, an award-winning broadcast organization based in Lexington, KY, would begin offering coverage of major races in Spanish. Heard in over 170 countries, HRRN’s new broadcasts would appeal especially to those in Latin American countries, in addition to the Latino population of the United States. The broadcasts are streamed online from the HRRN website and ElPotroRoberto.com, and are accessible in podcast form. Hosted by Roberto Rodriguez, and Venezuelan racing analyst Eloy Vielma, HRRN en Español began with the 2016 Jim Dandy stakes at Saratoga Race Course, and has since expanded to include a weekly “Hablando de Hipismo” program, which translates to “Talking about Horse Racing,” in addition to special racing event coverage. In the press release, Rodriguez recognized the importance of the racing industry reaching out to attract Latino fans: “In horse racing we have the highest representation of Spanish athletes than any other sport [sic] and people in our countries haven’t been able to fully enjoy the success of their favorite jockeys and trainers because of the language barrier. Now, with this amazing idea of HRRN en Español, Spanish speaking fans and horsemen around the world will be able to follow the fascinating Sports of Kings much closer in their own language” (“HRRN to Offer Coverage in Spanish,” 2016). The program is frequently visited by special guests, including Hall of Fame former jockey Ramón Dominguez, and features interviews in Spanish with prominent Hispanic jockeys and trainers.